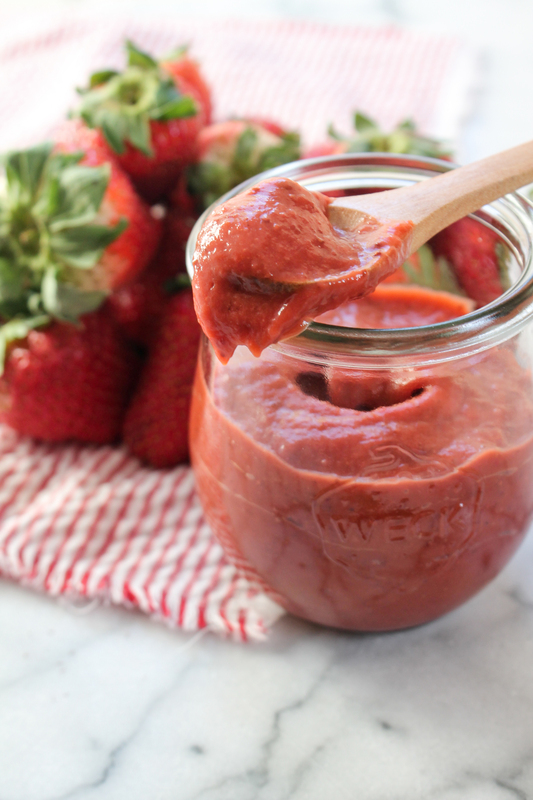 Whether you have a surplus of sweet summer berries or stocked up at the grocery store on mid-winter California berries, this Roasted Strawberry BBQ Sauce recipe is just what you need to make! It’s the perfect condiment to have ready to go for summer grilling or winter roasting! We live in a world where strawberries are in season year-round, thanks to the warm weather climates of our friends over in California. In New England, you can get them for the short summer season and they are the brightest jewels your mouth will taste. But since living in New England and loving strawberries so much, I couldn’t bare just having them in the summer, so I decided to boost their flavor with a blast in the oven and those this Roasted Strawberry BBQ Sauce came to life. That, and the fact that they were three for the price of one at the grocery store, so I couldn’t skip that deal! This quick and flavorful condiment has only SEVEN ingredients and can be whipped up in under an hour if you’re counting the time the strawberries are roasting for a bit in the oven. How to use this condiment: on sandwiches; slathered and grilled on chicken, beef, pork, tofu; tossed with some extra olive oil as a marinade for roasting vegetables; dolloped on every lunch you make, no matter what. PS: if you’re looking to reduce your plastic waste but still but strawberries, repurpose the clam shell containers they come in by bringing them over to your local farmers for reuse. They make the perfect seed-starting vessel! 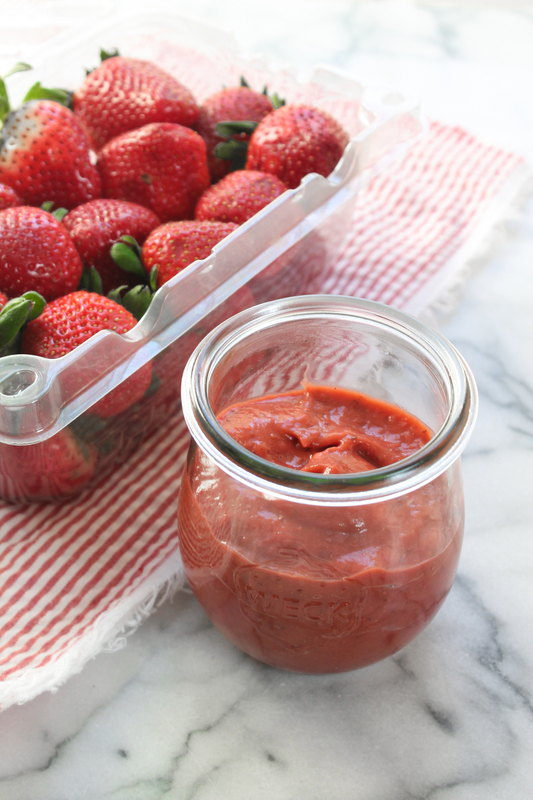 This Roasted Strawberry BBQ Sauce is going to become your go to condiment this spring and summer season! Bake hulled, quartered strawberries for 20 minutes. After the strawberries are roasted, in a saucepan over medium heat, melt the butter or oil and sauté the minced garlic for two minutes, until aromatic. Add the roasted strawberries and the rest of the ingredients. Lower the heat and simmer for 5 minutes. Using an immersion blender or traditional blender, blend until smooth. Cool and transfer to a covered jar. Keep refrigerated for up to two weeks.